(Nanowerk News) Small amounts of oil leave a fluorescent sheen on polluted water. Oil sheen is hard to remove, even when the water is aerated with ozone or filtered through sand. Now, a University of Utah engineer has developed an inexpensive new method to remove oil sheen by repeatedly pressurizing and depressurizing ozone gas, creating microscopic bubbles that attack the oil so it can be removed by sand filters. "We are not trying to treat the entire hydrocarbon [oil] content in the water – to turn it into carbon dioxide and water – but we are converting it into a form that can be retained by sand filtration, which is a conventional and economical process," says Andy Hong, a professor of civil and environmental engineering. In laboratory experiments reported online this week in the journal Chemosphere, Hong demonstrated that "pressure-assisted ozonation and sand filtration" effectively removes oil droplets dispersed in water, indicating it could be used to prevent oil sheen from wastewater discharged into coastal waters. 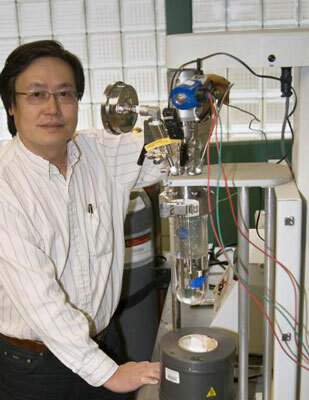 Andy Hong, a civil and environmental engineering professor at the University of Utah, used a chemical reactor similar to the one shown here to develop and test a new method for removing pollutants, including oil sheen, from water and in some cases soil. So-called "produced water" from oil and gas drilling sites on land. Such oily water normally is re-injected underground. "If we have technology to clean it, it could be put into beneficial uses, such as irrigation, especially in arid regions where oil and gas tend to be produced," says Hong. Water from mining of tar sands and oil shale. Groundwater contaminated by MTBE, a gasoline additive that reduces harmful vehicle emissions but pollutes water due to leaking underground gasoline storage tanks. "Emerging contaminants," such as wastewater polluted with medications and personal care products. Soil contaminated with polychlorinated biphenyls (PCBs, from electrical transformers) or polycyclic aromatic hydrocarbons (PAHs, from fuel burning). Water and contaminated soil would be mixed into slurry, and then treated with the new method. Heavy metals in soil. Instead of ozone, air and metal-grabbing chelating agents would be pressurized with a slurry of the contaminated material. Refinery wastewater and oil spills at refineries or on waterways. The spill could be vacuumed, and then treated with the new method on-site or on a barge. Hong conducted the study with two University of Utah doctoral students – Zhixiong Cha, who has earned his Ph.D., and Chia-Jung Cheng – and with Cheng-Fang Lin, an environmental engineering professor at National Taiwan University. Hong says his method uses two existing technologies – ozone aeration and sand filtration – and adds a big change to the former. Instead of just bubbling ozone through polluted water, Hong uses repeated cycles of pressurization of ozone and dirty water so the ozone saturates the water, followed by depressurization so the ozone expands into numerous microbubbles in the polluted water, similar to the way a carbonated beverage foams and overflows if opened quickly. The tiny bubbles provide much more surface area – compared with larger bubbles from normal ozone aeration – for the oxygen in ozone to react chemically with oil. Hong says pollutants tend to accumulate on the bubbles because they are not very water-soluble. The ozone in the bubble attacks certain pollutants because it is a strong oxidant. The reactions convert most of the dispersed oil droplets – which float on water to cause sheen – into acids and chemicals known as aldehydes and ketones. Most of those substances, in turn, help the remaining oil droplets clump together so they can be removed by conventional sand filtration, he adds. In his study, Hong showed the new method not only removes oil sheen, but also leaves the treated water so that any remaining acids, aldehydes and ketones are more vulnerable to being biodegraded by pollution-eating microbes. "These are much more biodegradable than the parent compounds," he says. Hong says the water is clean enough to be discharged after the ozonation and sand filtration, but that some pollution sources may want to use conventional methods to biodegrade remaining dissolved organic material. Hong conducted his experiments using a tabletop chemical reactor that contained about a quart of oily water made by mixing deionized water with crude oil from the Rangely oil field in northwestern Colorado. Ozone was produced by passing dry air through a high-voltage field, converting oxygen gas, which has two oxygen atoms, into ozone, which has three. The ozone was pressurized to 10 times atmospheric pressure, about 150 pounds per square inch, which compares with inflation pressures of about 100 PSI for Hong's bicycle and 35 to 40 PSI for many automobile tires. He found oily water was cleaned most effectively by pressurizing and depressurizing it with ozone gas 10 times, then filtering it through sand, then putting the water through 20 more pressurized ozone cycles, and then filtering it again through sand. That was at flow rates of 10 to 20 liters per minute [about 2.6 to 5.3 U.S. gallons per minute] in his laboratory apparatus. Hong tested how well the ozonation worked by measuring chemical and biological oxygen demands of treated water samples. Both indirectly measure organic contents in the water. Hong also used mass spectrometry to identify what contaminants remained in the water. He found that his most effective procedure removed 99 percent of the turbidity from the "produced water" – leaving it almost as clear as drinking water – and removed 83 percent of the oil, converting the rest to dissolved organic acids removable by biodegradation. With success in the laboratory, Hong now plans for larger-scale pilot tests. "It is economical and it can be scaled up," he says. One such test will be done in Wuxi, China, where a prototype desk-sized device capable of treating 200 liters [53 U.S. gallons] at a time will be tested at three to five polluted industrial sites that the government vacated for redevelopment, Hong says. Meanwhile, the University of Utah Research Foundation has entered into options to license the technology to Miracotech, Inc., of Albany, Calif., and 7Rev, L.P., a Salt Lake City venture capital group, so the companies can bring the technology to market. Hong says other methods of treating oil well "produced water" have met with varying degrees of success. They include centrifuges, membranes, regular ozonation and air bubbles to float off contaminants. But all have drawbacks, such as inability to handle dissolved oil or high levels of oil, or susceptibility to quickly getting fouled by the oil. Neither ozonation nor sand filtration alone has been able to effectively treat oily "produced water." Hong says long-chain oil molecules don't react with ozone easily without his pressure treatment. And sand filters alone cannot remove oil.